In the latest report titled – “Fast Food Wrapping Paper Market - Global Industry, Size, Share, Growth, Trends and Forecast, 2018–2026”, Transparency Market Research (TMR) delivers key insights on the consumption of the variety of fast food wrapping papers used in different end uses and applications. 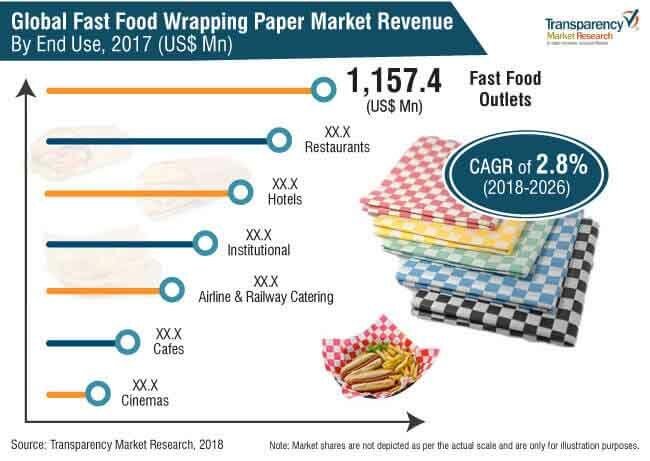 According to TMR, the global fast food wrapping paper market is projected to clock a CAGR of 2.8%, during 2018-26, which is attributed to several factors, on which, the report provides thorough insights and forecast. The Asia Pacific fast food wrapping paper market is expected to witness the highest CAGR value of 4.2%, during forecast period. A market research study on the global fast food wrapping paper market includes market assessment of different material types such as, plastic, paper, and aluminum foil. The plastic segment is further sub-segmented into polyethylene, polypropylene, polyamide, polyvinyl chloride, poly lactic acid, and EVOH. The paper segment is further sub-segmented into kraft paper and specialty paper. Specialty paper is then further divided into three major types i.e. greaseproof paper, wax paper, and foil paper. TMR suggests that the increasing consumption of packaged fast food products is expected to be the key driving force for the growth of fast food wrapping paper globally. Wrapping paper manufacturers are looking to invest in the advancement of their existing production processes through the installation of sophisticated and automatic paper producing machines. The global fast food wrapping paper market is also fuelled due to the increasing sales of fast food through online food service and delivery platforms which require high-end functional packaging to keep food fresh and warm while in transit. More and more consumers prefer buying fast food from online home delivery platforms due to their high convenience and discounts offered by these e-retailers. The demand for wrapping paper is expected to go up due to the increasing pressure to use environment-friendly packaging solutions on food-service providers and companies. Therefore, companies are trying to eliminate harmful plastic-based packaging products. This will result in the growth of paper-based fast food wrapping paper, but it might result in a sluggish growth of the plastic-based fast food wrapping paper market. Paper-based fast food wrapping paper is expected to create the highest incremental $ opportunity during the forecast period. Plastic-based fast food wrapping paper is expected to witness a CAGR value of 2.4% during 2018-2026. On the basis of fast food type, the burgers segment in the fast food wrapping paper market occupies the top spot as wrapping paper is the most suitable packaging product for this segment. Most of the global fast food companies already use wrapping paper for the packaging of burgers. Recently, the sandwiches segment has emerged as the most attractive segment in major countries due to the ever-increasing demand for sandwiches. Consumers are increasingly preferring fast food items such as pizza, burgers, and sandwiches over their daily meals, which in turn increases the demand for fast food wrapping paper globally. Most of the key manufacturers in the fast food wrapping paper market are planning to offer sustainable packaging solutions to their clients due to the high demand for these solutions in developed countries such as, Germany, U.S., Italy, and France. Foodservice restaurants are forming long-term strategies to eliminate harmful plastic solutions, which in turn create high demand for paper-based fast food wrapping paper in these countries. However, foodservice companies also look forward to taking their regional strategies to a global level and creating a sustainable demand for eco-friendly wrapping papers, during the forecast period. The Asia-Pacific fast food wrapping paper market is expected to offer substantial growth opportunities to the local and multinational manufacturers. The demand is primarily driven due to the high growth in the consumption of fast food items in countries such as India, China, and ASEAN countries. Growth in consumption of fast food wrapping paper is driven by increasing disposable incomes of the middle-class households who demand convenience food products at reasonable costs. The key players profiled in the global fast food wrapping paper report include– Berry Global, Inc., Delfort Group, Georgia-Pacific LLC, Twin Rivers Paper Company, Hindalco Industries Limited, Huhtamaki Oyj, Mitsubishi Chemical Holdings Limited, Amcor Limited, Mondi Group, Reynolds Group Holding Limited, Thong Guan Industries Berhad, The Clorox Company, United Company RUSAL Plc, Hulamin Limited, Anchor Packaging Inc., Harwal Group, Oji Holdings Corporation, S. C. Johnson & Son, Inc., Nordic Paper AS, Advanced Coated Products Ltd. (The Food Wrap Co.), Pudumjee Paper Products Ltd., KRPA Holding CZ, a.s., BPM, Inc., Seaman Paper Company, and Schweitzer-Mauduit International, Inc.